Display sculptures and other artworks on a pedestal for maximum visual impact. For displaying 3D works of art, a pedestal is the ideal way to do it. With a pedestal, the artwork has a sturdy base to hold the weight of the item and to keep it steady and away from harm. With SMI Display PEDESTALS, it's easy to find a place of honor to display a masterpiece. The clean lines of the pedestal draw the eye without distracting from the beauty of the work of art. 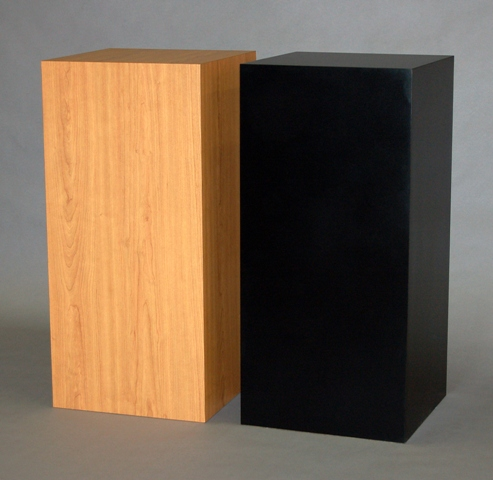 Choose from the pale blond color of the cherry laminate or the deep, solid color of the black matte version. Display art at the right height with a choice of 24", 32", 36" and 40" pedestals. Each has a square 15" display area. Oversized shipping is $70.95. Please allow four to six weeks for delivery. Choose from among two colors and four sizes to give 3D artwork a sturdy base and a visual sign of importance.